This area is concerned with the interaction of mankind with the water environment. Past studies have dealt with modelling and analysis of various geophysical processes (e.g., water waves, open channel flows, sediment transport and stratified flows, rainfalls, floods, riverflows) for the planning, design, and management of a large number of water resource projects (flood protection works, river diversions and impoundments, channel improvements, rural and urban drainage, etc.). At the present time, the research activities of this group are divided into two broad categories: hydraulics and fluid mechanics, and hydrology and water resources management. In the areas of hydraulics and fluid mechanics, some current research problems are turbulent jets and plumes, waste heat discharge in lakes and reservoirs, ocean outfalls, mathematical models of turbulent flows, ice hydraulics in rivers, motion of ice flows in artic waters due to wind and water currents, mud and debris flows, flows properties of dense suspensions of liquids and solids, flows of granular materials, roll waves, rock avalanches, pyroclastic flows, and sediment transport in coastal and estuarine regions. 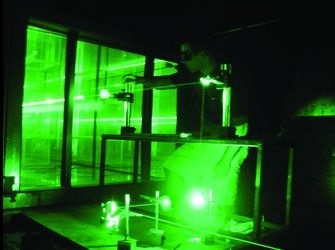 Research methods involve both experimental modelling, in which flow dynamics and mixing mechanisms are studied using a combination of flow visualization and non-intrusive concentration and velocity measurements (LIF, PIV), and numerical modelling, using models ranging from integral models to large eddy simulation of turbulence. In the areas of hydrology and water resources management, current research deals with modelling and simulation of rainfall and flood flow processes, regional estimation of extreme hydrologic variables, automatic calibration of conceptual hydrologic models, modelling of urban storm drainage and river basin systems, and multi-purpose reservoir systems operation and management. Research methods are mainly based on mathematical modelling and computer simulation techniques (statistics, probability, stochastic processes, neural networks, local and global optimization methods, Monte-Carlo simulation). The research facilities include several flumes and channels of various sizes; miscellaneous equipments such as pumps, water tables; electronic equipment including hot-film anemometers, miniature flow meters, conductivity probes, light absorption probes; video cameras and image processing equipment; microcomputers and workstations for data acquisition, and numerical computation and simulation work.